The Hill Has Eyes Milwaukee Haunted House Experience: A Horror Extravaganza - http://mke.hillhaseyes.com/ Take a Ride on the Scare Lift and Dare to Escape Wisconsin's Haunted Trails The drivers didn't know they were hauling truckloads of chemical waste to the old abandoned quarry outside Milwaukee, Wisconsin. Under a blood moon, they dumped their cargo without any warning to the nearby trailer park. A simple wooden sign was posted into the ground, No Man's Land By Order of the US Government. A million gallons of toxic sludge seeped into the soil below. The people in the trailer park had no chance and, when they rose, they were scarcely people at all. Minds twisted and bodies scarred, the mutants awoke hungry for human flesh. Test your courage through five gruesome attractions, all for the price of one. The Hill draws you to it, draws you in as the living flesh its inhabitants crave. Don't expect the armed guards to rescue you. They're there to keep you in, to fulfill the unholy pact between your government and the mysterious figure even the mutants fear. Enjoy our haunted attractions along with nightly music, bonfires and food and beverages. 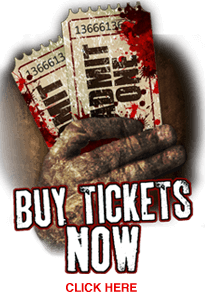 ABOUT "THE HILL HAS EYES"
Take a Ride on the Scare Lift and Dare to Escape Wisconsin's Haunted Trails and test your courage through five gruesome attractions, all for the price of one: Admission: $20-$53. This is a different experience than a typical haunted house. They have scares, they have gore, but what makes it different is that it's a longer experience, and you're walking though a variety of settings and even onto the ski lift... but don't expect scares on the lift, I imagine it's a safety issue. Unique venue , thus haunted house is Unlike any other! Up on a mountain and totally outside never expecting what's coming out of the woods! This was a great group event! Drinks after great addition! I loved that it was outdoors, I will be going back this year! The Hill Has Eyes is a great Halloween attraction! I went through in a small group, just myself and two others, and I went first... I've never had more fun at a haunted event! I was disappointed to find there was no beer available for purchase after each stop, as we were told there would be. Other than that mild disappointment, it was a great time. It was funny and scary at the same time. The outdoors / twisting & turning trails get you disoriented, and you feel lost about 15 minutes into it. The woods are spooky, the actors follow along a story line, which most haunts dont do. I also liked the bonfires, and they have a bar at the waiting area. All true Wisconsin Haunts should offer beer. The top of the hill has been greatly improved in 2015, and i would recommend going on thursday or sunday, (less crowded) and buying tickets online to save time. Went last 3 years. Gets better each year. Outdoor haunt through the woods at an old ski hill creates a creepy vibe.